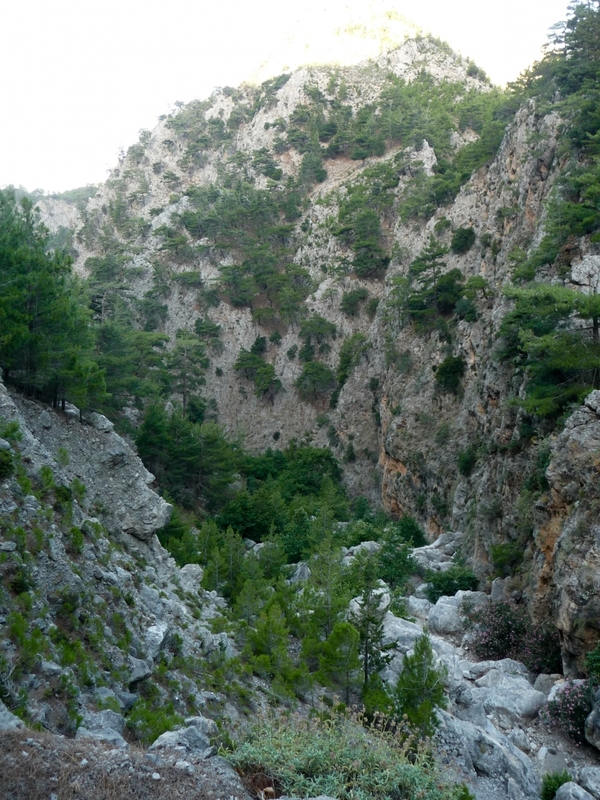 Agia Irini is the second Crete’s gorge in importance after the famous Samaria ones. It’s a good alternative (less crowded). 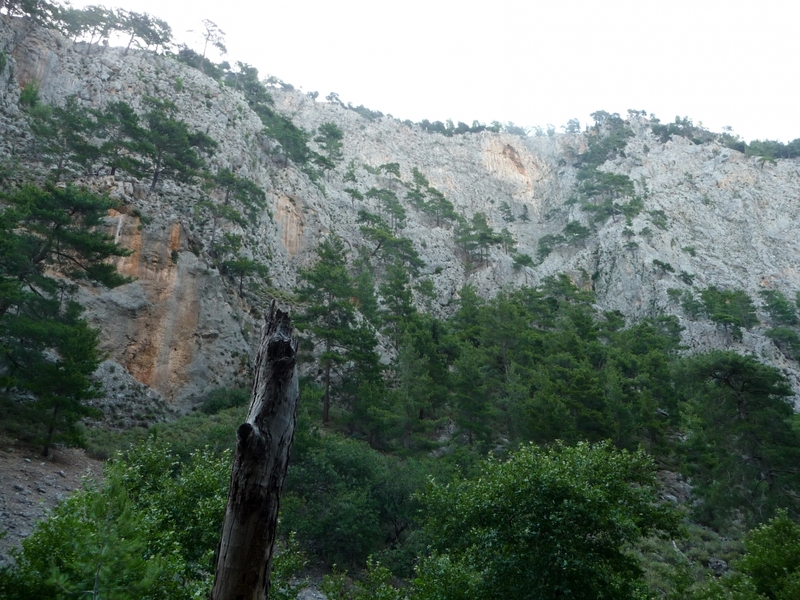 It’s quite wooded and maintains its depth and rugged grandeur for the major part of the length (7,5 Km). The gorges are formed mainly in carbonate rocks, i.e. limestone and marble. 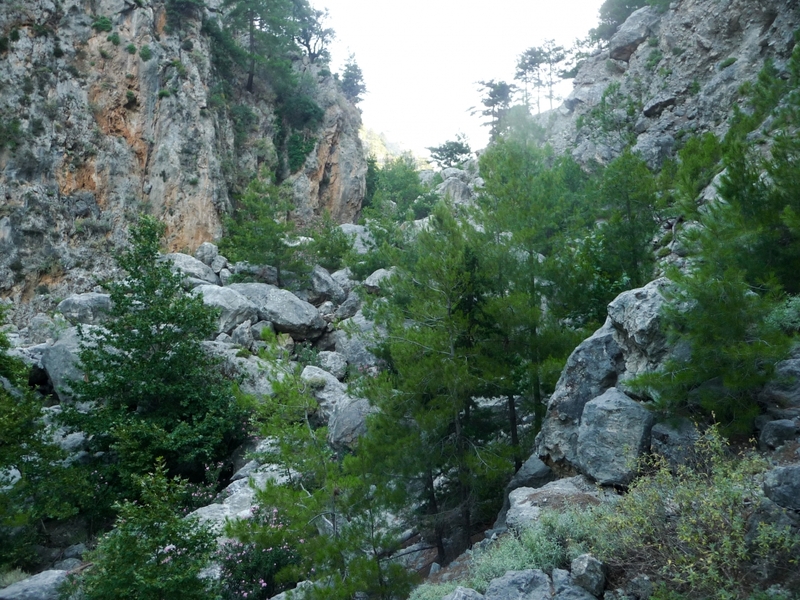 Since the late Miocene period, 5 to 10 million years ago, the intense uplift of the whole Cretan area, due to plate tectonics, accelerated carbonate rocks weathering and erosion by water of the rivers forming not only many gorges but also caves and plateaus. 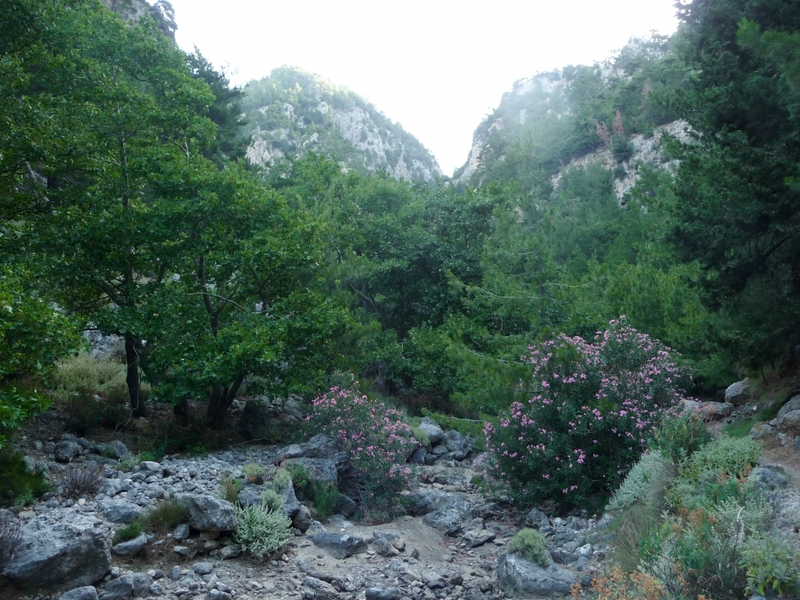 Is located in the outer western White Mountains (“Lefla Ori”) and starts 1Km to the south of the Agia Irini village and ends (7,5 Km) close to “Oasis” tavern where an asphalt road begins. The “E4” European path goes though it. 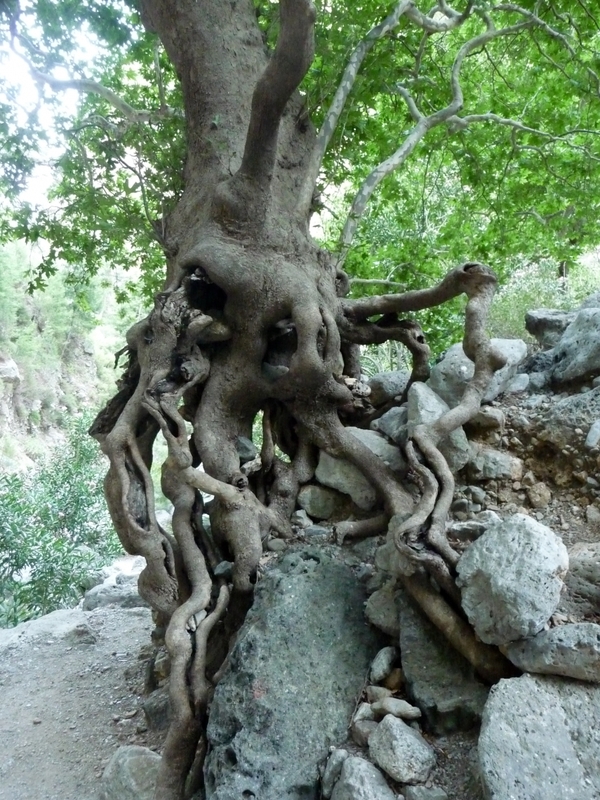 It’s a good alternative to the Samaria gorge because is less crowded. The environment and landscape are interesting for the major part of the length. 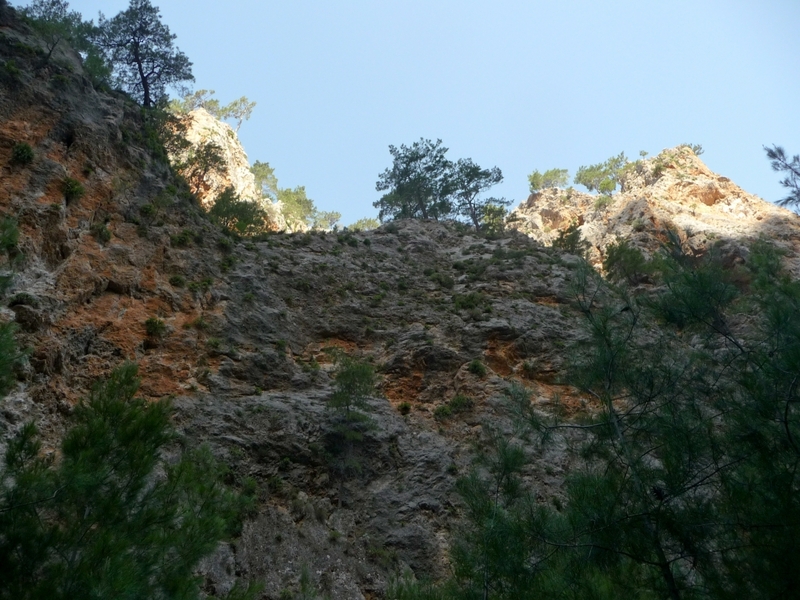 It’s quite wooded: in the upper part the stream bed is occupied by Oriental Plane (Platanus orientalis) and Oleander (Nerium oleander), then Cypress (Cupressus sempervirens) and Turkish Pine (Pinus brutia) dominate; this latter particularly on the gorge walls. The hike is easy: you go mostly downhill, but there are also two stretches where the path goes uphill (D +100) and moves away from the gorge bottom; only a point requires the use of your hands for balance and extra protection. 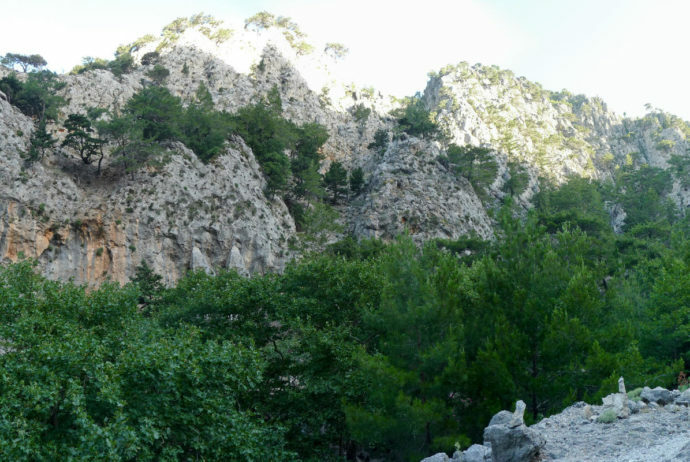 You have to carefully plan your hike and the way to come back, because from the gorge exit there are 2,7 Km of asphalt road to get to the junction to the main road to Sougia (where the bus stops) and 2,4 Km more to get to Sougia. If you have a car, you can park at the entrance and come back by bus or taxi from Sougia. 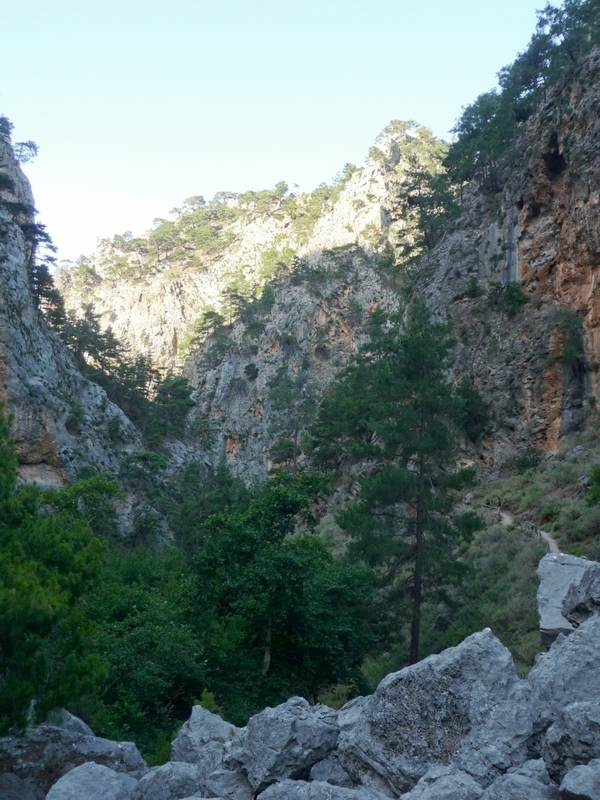 You can even try to hitchhike the way back but, from the gorge exit, only few cars pass through; it is more likely from the junction with the main road for Sougia. 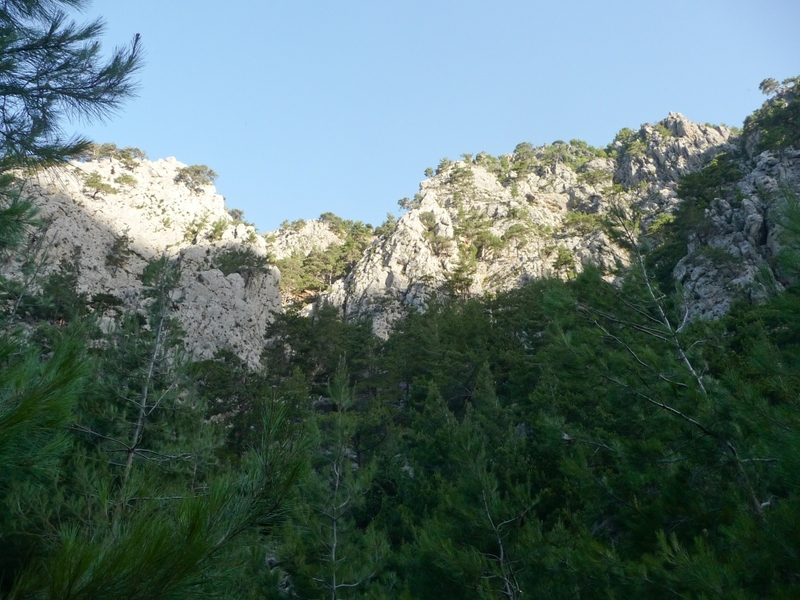 Another way, if you are located in Sougia, is to take the public bus to Hania in the early morning and get off at the entrance of the gorge or to take a taxi. 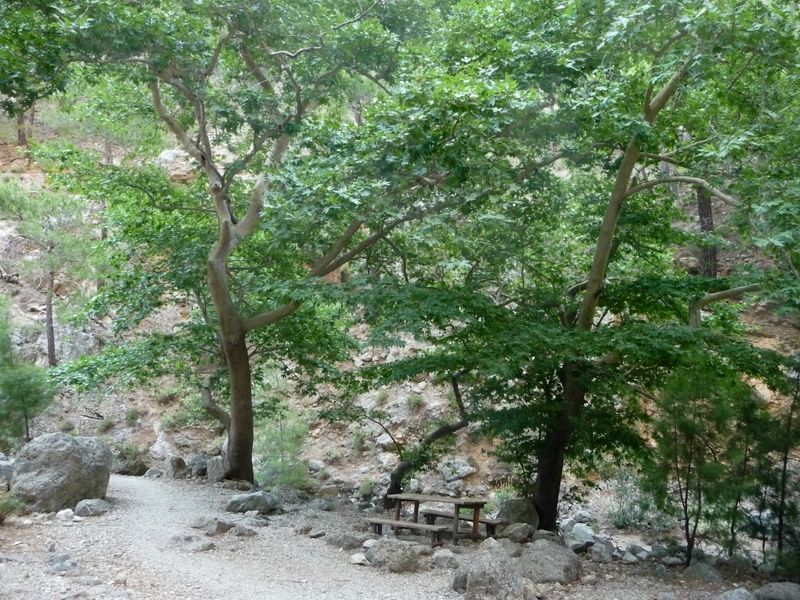 We parked the car at the gorge entrance, after passing through the gorge we walked up to the junction and took the bus to Sougia. Then we took the bus from Sougia to Agia irini. The entrance ticket is €2,00/pp (2017). Bus ticket Sougia-Agia Irini €2,30/pp (2017). I and my partner Gabi, park the car near “Porofarago” tavern (625m), since we have been told that at the parking place at the gorge entrance, goats often climb on the cars to graze leaves of the trees. We start walking on 7,30. At the beginning we are alone and the sun is covered by the gorge walls not visible yet. As always we bring plenty of water although in this gorge there are 4 rest areas with drinking water, contrary to many other gorges. were the fountains are not working. The landscape is wonderful; never ordinary. 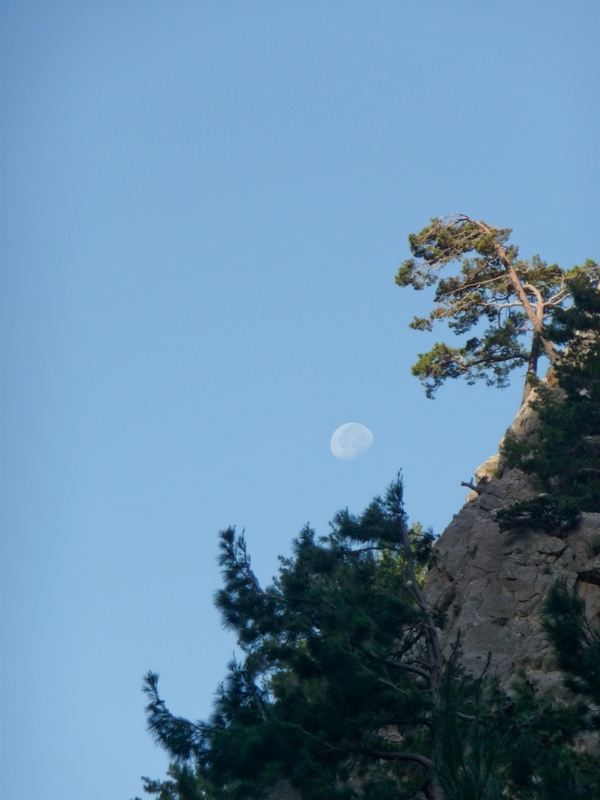 I’m impressed by the Turkish Pine trees clinging to the rocks of gorge walls. Where the path goes uphill and moves from the bottom of the gorge we have a larger view of the gorge. 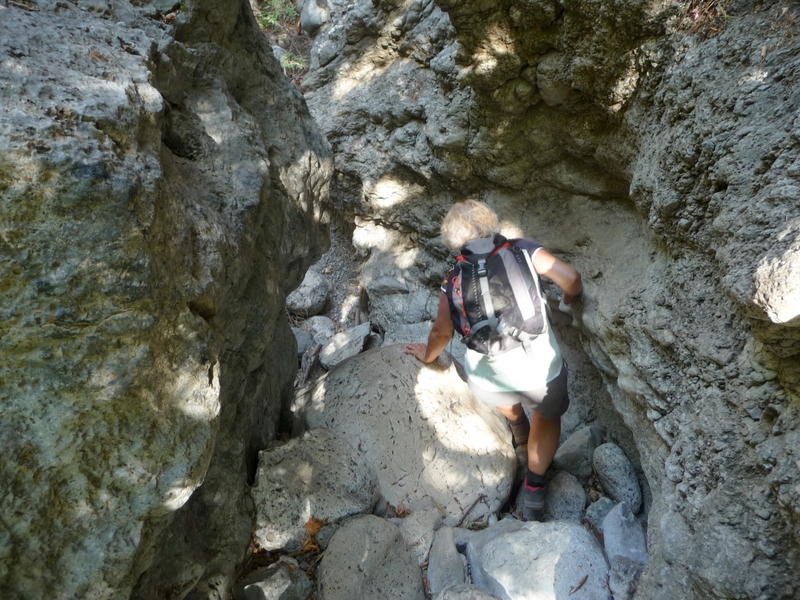 After a stretch where the gorge is large but walls are very high (500m), we pass through a narrow section. This is the final part of the gorge. 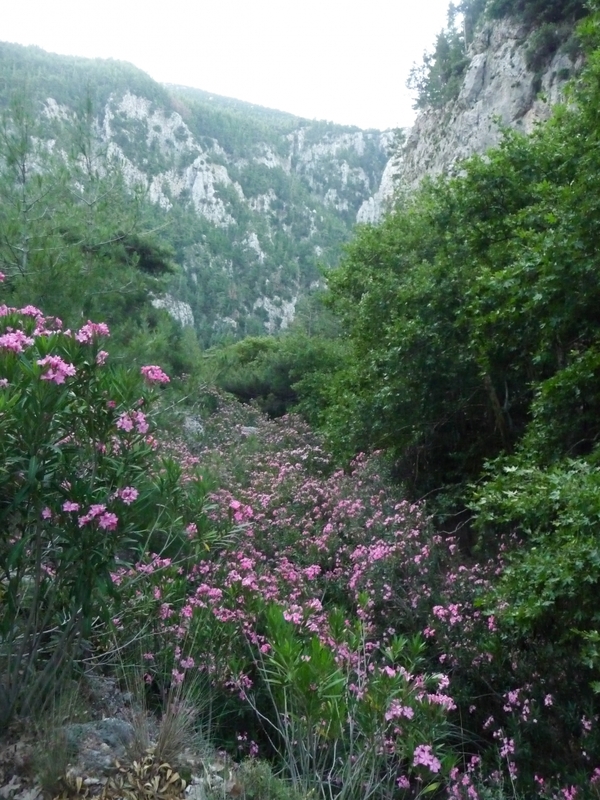 The temperature is raising, (today the maximum foreseen at Sougia is 37 °C). 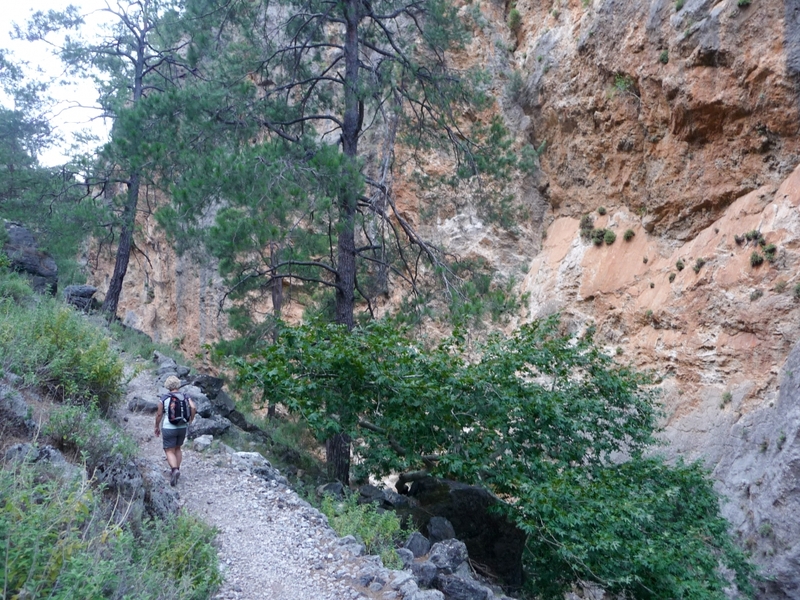 At 10,30 (3h00’) we get to the gorge exit (165m) close to “Oasis” tavern. The shadow has disappeared, we deal with 2,7 Km of asphalt road to get to the junction to the main road to Sougia hoping to find a lift. 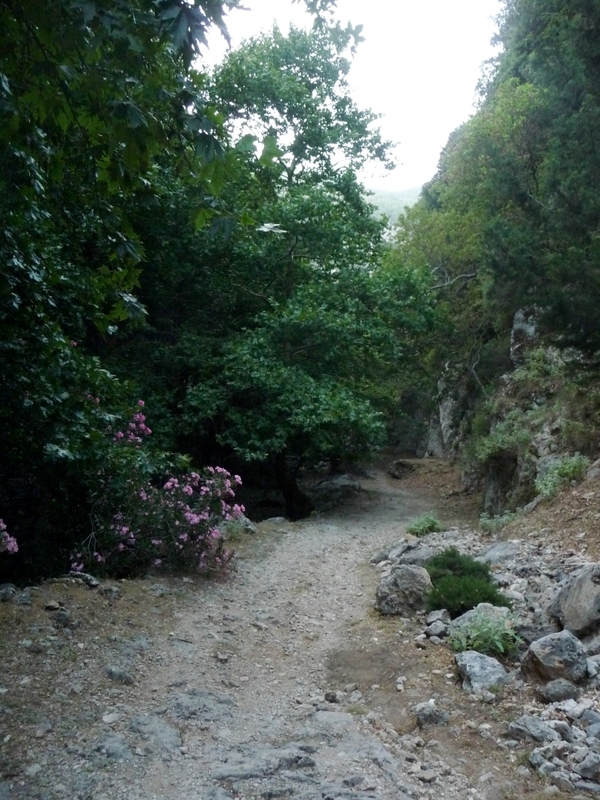 When we have just arrived to the junction at 11,00 (3h30’) the bus to Sougia is approaching and we take it. So we have avoided 2,4 Km; which with this heat it’s a good thing! At Sougia we decide to have a short swim and to go back taking the bus to Agia Irini at 12,30 (the next is at 18,30) and we are not in the mood to stay in Sougia any longer because of the heat. At 13,30 we are at the bus stop of gorge entrance. In the gorge there is a poor GPS signal, so the registered track is not precise.